Plumage from a variety of birds, including the black tail feathers of the bird of paradise, was mounted along the edges and at the apex of the dance frame, often on springs constructed from broken pig jaws or lengths of supple cane. The feathers were counterweighted with seedpods and bounced vigorously when the dancers moved. 'Gaheisi' were strapped to the dancers' shoulders with lengths of vine, leaving their arms free to carry drums, rattles or weapons. (9) Before dawn on the day of the pig exchange, the entire clan set off to the host village. 'Gaheisi' were donned and the dancers from each clan would sing, drum and dance for many exhausting hours until the moment in the afternoon when the large cooked pigs for formal presentation were ceremoniously brought forward. Following the festivities, the gaheisi were discarded in the kunai grass. Contemporary adaptations of these dance banners are now made and worn by a number of eastern highlands groups for competition at the Goroka and Mount Hagen cultural festivals. They are constructed from manufactured materials, most commonly imported fabrics or plastic rice and flour bags, and decorated with brilliantly hued commercial paints. Some designs are traditional, albeit rendered in vivid modern colours. Others incorporate political slogans or distinctly western modes of representation, demonstrating the highlanders' continuing engagement with past traditions and their inventive appropriation of contemporary materials and means of artistic expression. 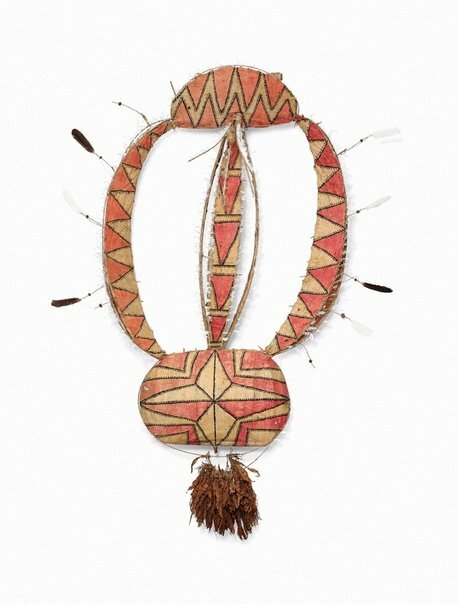 Natalie Wilson, 'Gaheisi (ceremonial dance banner)', in Natalie Wilson (ed), Plumes and pearlshells: art of the New Guinea highlands, AGNSW, Sydney, 2014, pp 35–37. (1) At the time of first European contact in 1930, when Michael (Mick) Leahy and Michael (Mick) Dwyer travelled up the Asaro and Benabena rivers and into the Goroka Valley, as many as 50 000 people were living in the region. Today, there are approximately 16 000 Alekano speakers in this area. Alekano and Gahuku-Gama are used interchangeably to denote the language and people of this cultural group; Alekano is the current term adopted by the Summer Institute of Linguistics (SIL). See Terence E Hays, 'Gahuku-Gama', Encyclopedia of World Cultures, 1996, www.encyclopedia.com (accessed October 2013). (2) Lewis L Langness, 'Ritual, power and male dominance', Ethos, vol 2, no 3, autumn 1974, p 193. For a full account of the 'nama' cult see Kenneth E Read, 'Nama cult of the central highlands, New Guinea', Oceania, vol 23, no 1, September 1952, pp 1–25. (3) Terence E Hays, 'Sacred flutes, fertility, and growth in the Papua New Guinea Highlands', Anthropos, Bd 81, H4/6, 1986, p 441. (4) Langness, p 194. In initiation ceremonies over three successive occasions – in early childhood, adolescence and shortly before marriage – 'age-mates' were progressively inducted into the painful rituals of swallowing lengths of cane or kata. They were also taught the secret melodies of the nama flute and the skills of fighting, clan lore and hunting. (5) 'Iza nama' often involved the slaughter of up to 500 pigs. (6) In his 1964 thesis Langness refers to these ceremonial decorations using the Benabena term 'kafi', later changing the spelling to 'kafe' in his 1974 paper (cited in footnote 2). See Lewis L Langness, 'Bena Bena social structure', PhD thesis, University of Washington, Seattle, 1964, pp 81–85. I am indebted to linguist Ellis Deibler for providing the Alekano term gaheisi to describe these dance banners. In correspondence with the author, 2 October 2013, Deibler also noted: 'Nama is not the word for flute. There is a word for the sacred flutes. 'Nama' means (primary meaning) 'bird'. Then it also comes to mean 'song'. When the men used to play the sacred flutes at night, when no women were around, and the question was asked, 'what is that? ', the reply was "nama". They pretended it was birds singing.' Deibler spent many years living with the Alekano people and compiled the Alekano-English dictionary for SIL. I am also grateful to Terence Hays, Professor Emeritus of Anthropology at Rhode Island College, Providence, Rhode Island, for offering invaluable suggestions for this text. (7) Rowena Hill, ‘Traditional barkcloth from Papua New Guinea: materials, production and conservation’, in Margot M Wright (ed), Barkcloth: aspects of preparation, use, deterioration, conservation and display, Archetype Publications, London, 2001, pp 27, 30, 38, 39. Black is sourced from charcoal from a number of charred plants and mixed with plant resin or pig fat, or from carbon deposits from paraffin and mixed with water, saliva or plant sap. (8) Tony Tuckson (ed), 'Aboriginal and Melanesian art', Art Gallery of New South Wales, Sydney, 1973, p 53. (9) Langness 1974, pp 197–98. Various magical items, some intended to attract female attention and others to protect against sorcery, were sometimes attached to Benabena kafe.